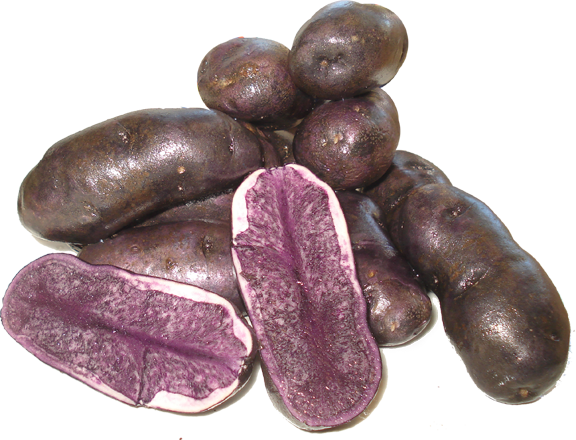 Sold Out 2019 -This late maturing, dark blue skin and flesh variety has round to oblong tubers. A very heavy setting, large plant that should be spaced at 12 inches or more in an effort to get it to maturity by fall. The flavor is remarkably normal for such a distinctively visual variety. This late maturing, dark blue skin and flesh variety has round to oblong tubers. A very heavy setting, large plant that should be spaced at 12 inches or more in an effort to get it to maturity by fall. The flavor is remarkably normal for such a distinctively visual variety.